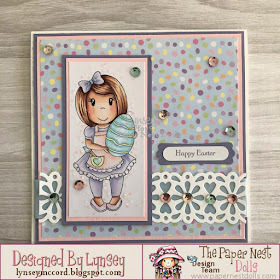 Hi everyone today I wanted to share a card I have made for Easter using the adorable Egg Coloring Lulu. I have coloured her completely with copic markers. I have used matching card and emblishements to show the pastel colours. I have used lots of glitter glue which is always tricky to see in a photo. If you like her click on the link to go straight to the shop.